Request object info on the object There's a little complication here: We can't decide to request this at any time, as by then the object might have vanished, and the region as well. 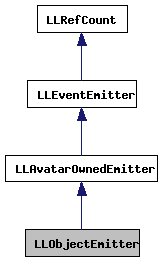 Object emitter An object, owned by an avatar, is producing this event. Definition at line 238 of file llfloatereventlog.h. Definition at line 145 of file llfloatereventlog.cpp. 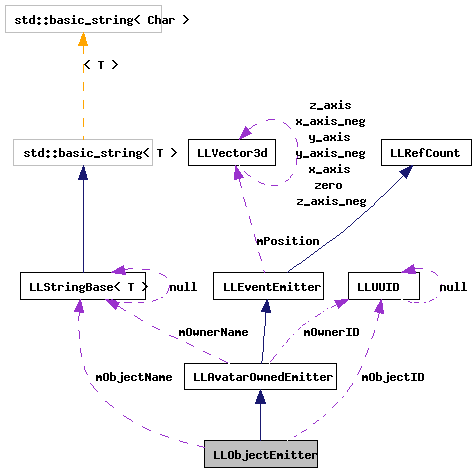 References mRequestedProperties, setObject(), and LLAvatarOwnedEmitter::setOwner(). Definition at line 153 of file llfloatereventlog.cpp. References mRequestedProperties, requestObjectInfo(), setObject(), LLAvatarOwnedEmitter::setOwner(), and LLEventEmitter::setPosition(). Definition at line 247 of file llfloatereventlog.h. Definition at line 244 of file llfloatereventlog.h. Definition at line 249 of file llfloatereventlog.h. Definition at line 250 of file llfloatereventlog.h. For this reason, this function only gets called from the constructor with the LLViewerObject argument, or when the event is being updated, when the object is still obviously there. Definition at line 178 of file llfloatereventlog.cpp. References _PREHASH_AgentData, _PREHASH_AgentID, _PREHASH_ObjectData, _PREHASH_ObjectID, _PREHASH_RequestFlags, _PREHASH_RequestObjectPropertiesFamily, _PREHASH_SessionID, LLMessageSystem::addU32Fast(), LLMessageSystem::addUUIDFast(), gAgent, LLViewerRegion::getHost(), LLAgent::getID(), LLAgent::getSessionID(), gMessageSystem, LLUUID::isNull(), llendl, llinfos, mObjectID, mObjectName, mRequestedProperties, LLMessageSystem::newMessageFast(), LLMessageSystem::nextBlockFast(), LLMessageSystem::sendReliable(), and LLAvatarOwnedEmitter::update(). Definition at line 245 of file llfloatereventlog.h. Definition at line 168 of file llfloatereventlog.cpp. References llendl, llwarns, mObjectID, and mObjectName. Definition at line 265 of file llfloatereventlog.h. Referenced by getID(), getObjectID(), requestObjectInfo(), and setObject(). Definition at line 266 of file llfloatereventlog.h. Referenced by getName(), getObjectName(), requestObjectInfo(), setName(), and setObject(). Definition at line 267 of file llfloatereventlog.h. Referenced by LLObjectEmitter(), and requestObjectInfo().